Earlier this year, the Rafa Nadal Tour by Mapfre was launched. This admirable initiative has received very little exposure outside Spain and we feel it deserves to be more widely reported. The following article was translated by nou.amic for us in February. It sets out the backgroud to this venture. Rafael Nadal wants to make use of the magnitude of his own personal image to look for new talent. 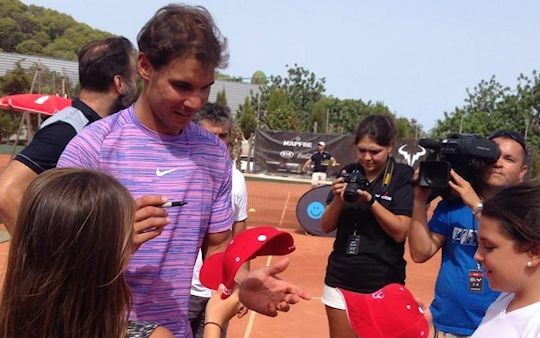 By means of his Foundation and one of his main sponsors, the Balearic player has set in motion the project 'Rafa Nadal Tour by Mapfre', a circuit for Under-13s and Under-15s that in addition to encouraging competition between the youngest players wishes to promote sports values in tennis players in the making. "The 'Rafa Nadal Tour by Mapfre' was created at the express desire of Rafael, who for a long time has had in mind setting up a tennis circuit for the youngest players. From the outset, it was Rafa who raised the necessity for these tournaments not just to focus on competitive tennis, but for them also to promote values and attitudes, like team spirit and effort. He also chose that the tour be for Under-13 and Under-15 age groups, in view of the memory he has of always playing with boys older than himself," commented Alba Plana, of the tour's information office. The main aim of this project, which gets under way in 2014, is to reinforce the young tennis players' basic attitudes and behaviour both on and off court, as well as give them the opportunity to participate in a tour/circuit that promotes competition. On the other hand, it will enable funds to be raised for the education projects the Rafa Nadal Foundation promotes for the benefit of socially disadvantaged children and adolescents, both in Spain and in India. At the moment the tour plans to make four stops: Seville (Asociación Recreativa Río Grande, 14th-23rd March), Barcelona (Club Esportiu Valldoreix, 25th May-1st June), Madrid (Ciudad de la Raqueta, 18th-27th July) and Mallorca (venue and exact date in September to be decided), where the Masters Final will be played. Each tournament will have qualifying rounds according to the number of entries at the time, as well as a main draw with a maximum of 64 players (50 direct entry, 8 qualifiers and 6 wildcards). All the participants will receive a gift - sports equipment - just for taking part and, depending on the final results, they will earn points that will count towards participation in the Master Final: the tournament champion will get 300 points, the finalist 150 pts, the semifinalists 75 pts, quarterfinalists 40 pts, R16 20 pts, R32 10pts and R64 5 pts. A tennis tournament circuit has been set in motion this year by the Rafa Nadal Foundation, which is presided over by the tennis player's mother, Ana Maria Parera, to give a determined impulse to tennis at formation level and foment the educational aspect of sport. With the world number one's image of constancy and giving his all as a reference, the Rafa Nadal Tour Mapfre circuit of tournaments for Under-13's and Under-15's has been created with the fundamental objective of fomenting the values of the new generations called on to take over from the present Spanish professional players. J.F. Fernandez is the director of the circuit which has already seen the light of day in Seville where 240 young tennis players took part. The next stop is Barcelona, Valldoreix to be exact, at the end of May, Madrid is the third, in July, and it will end with a Masters in Mallorca in September,with the world number one present. In following years, several other Spanish autonomous communities, like Galicia, the Canary Islands, Valencia and Murcia want to join the project. What is for certain, as Rafa's manager, Carlos Costa, stated, is that the circuit is focalized on Spain. "First we have to do things well here," he said. Nadal's passion for tennis knows no limits. J.F. 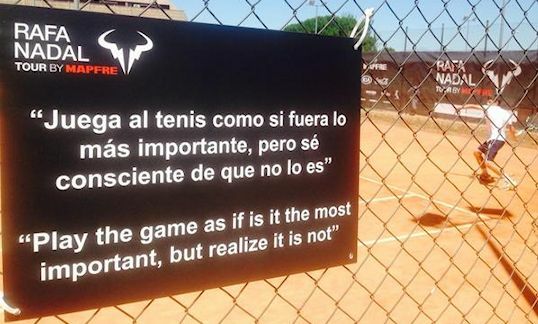 Fernandez gave the detail that the organisation of the circuit have made signs that are displayed on the court where the boys and girls compete to get to the Masters in Mallorca: "Sacrificio, superación, compañerismo y educación". "Giving your all, overcoming difficulties, team spirit and manners" are the rules of the game which, as well as the results in the matches, will decide who gets the eighth place for the trip to Nadal's home island in September. The other seven candidates will be those who have had the best results in Seville, Barcelona and Madrid. Rafa is without any doubt the most appropriate ambassador to transmit all the values the organizers are looking for in 13 and 14-year-old kids, who are at a key age that will possibly mark their future, especially as persons. "For that reason, we organize some short formation courses parallel to the competition that are compulsory for all the participants," noted Fernandez under the watchful gaze of Carlos Costa, Rafa's right hand man. The tennis player's personal stamp is there in the bull logo that is to be found on all the social networks. The Rafa Nadal Foundation was set up in Spain in November 2007. It offers education programmes through sport to children and young people who are underprivileged or at risk of social exclusion. Its objective is to transmit the values it considers most important for a complete formation, such as respect, equality, self-esteem and the spirit of excelling oneself. Currently the Foundation looks after more than 500 children in its projects in Spain and India and with its programme 'Más que tenis' (More than tennis) along with Special Olympics España it has fostered the practice of tennis for more than 100 young people with mental discapacity. The programme 'Integración y deporte' (Integration and sport) carried out together with Aldeas Infantiles SOS helps young people with problems of social integration by means of the practice of sport. At the moment, Rafa Nadal is the most powerful image that can be used in the world to transmit any message. Carlos Costa knows of the hardships being suffered in our country and he assured that in the next few years "the Foundation will begin to grow on Spanish soil, while maintaining its project in India." You can find more information (plus many photos and videos) on the Rafa Nadal Tour by Mapfre website. It's also worth checking the Foundacion Rafa Nadal Twitter page for even more images. ... and, of course, gave out the trophies.